‘Mateship’ | Between a Hard Rock and a Place. The previous Australian government, and more specifically Prime Minister John Howard, loved the word ‘mateship’. It got thrown around everywhere, including the constitutional preamble draft, and it was made into a word and a phenomenon in the process. But I wonder what he was actually thinking mateship was all about, and why he referred to the concept so much? “Well, we do use the word ‘mate’ a lot,” remarks a well-researched advisor. I kind of think Tony may not had the chance to come up with a uniquely Australian definition before it went to air at the next ‘Meet The Press’ luncheons. We do use the word ‘mate’ a lot. You use it to refer to someone you forget the name of. You use it to replace the word ‘friend’ when you are around a bunch of Australian guys. You use it to name a person you interact with briefly before never seeing them again. You can use it to respond to a surprising situation. Some really close friends use it as a term of endearment, but I would suggest this is very rare. I tend to not call people ‘mate’. I just don’t like doing it. I don’t mind people calling me mate, but I can’t help wondering sometimes whether people have just forgotten my name. In the case where someone’s name is not known, the word mate is a great default. I will use it to politely summons a male shop assistant or thank a guy on the street for helping me with directions. I believe that one of the most powerful forms of affirmation comes by using peoples’ names when you engage or interact with them. When you have this opportunity to affirm so effortlessly in conversation, why not take it? Using the word ‘mate’ seems to blow the opportunity. Of course, if you do legitimately forget someone’s name, it is a great default. It is culturally the next best thing. When I think of ‘mateship’, to be honest, I think of a bunch of males drinking beer around a barbecue, talking about fishing, the cricket or something similarly safe. I never imagine females when I hear the word, so I am wondering if they are excluded, or maybe just not as included. As soon as I picture these guys talking about deep life matters, I imagine mateship being trumped by a deeper connection. It is as if the friendship has become more personal, and the word ‘mate’ is no longer strong enough. 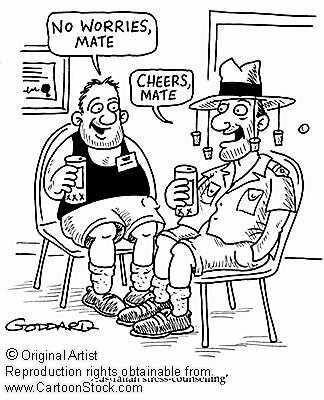 When it comes to mateship being likened to friendship, it would be foolish to assume Australians have exclusive rights to it. Every culture has friendship! In my experience, I have found that intercultural friendships have deepened my understanding of what can be experienced in relationship. So I struggle to identify what it is about the uniquely Australian ‘mateship’ that is so worthy of raising it up as part of our national identity. So how is it the concept of mateship in our nation can be revered with such pride, when the phenomenon behind this unword is so difficult to understand? I agree that the word ‘mate’ is not used correctly today, but when I hear about ‘mateship’, my mind immediately goes back to my Grandpa being carried on the shoulders of a ‘mate’ through a battlefield in WWII. I also think about my other Grandpa (who probably new yours), working with 5 or 6 ‘mates’, building each other’s houses in Australia’s southwest as they tried to make a go of it in the Aussie bush… and about working with a ‘mate’ on the other end of a long bow saw cutting huge trees in the Pemberton forrest. These ideas of ‘mateship’ are almost completely lost – but I believe they should be remembered and cultivated. They speak of going through hardship together and standing by each other no matter what is thrown at you.